DESCRIPTION: IWS contracted with the Yuba County Department of Public Works to install and construct the new MBR treatment system. The River Highlands WWTP Replacement Project was designed to treat and disinfect the wastewater to meet Title 22 standards, with final dispersal to a holding pond adjacent to the wastewater treatment plant.on. IWS did a great job, the project went well, and we appreciate the team work and skill IWS brought to the project. 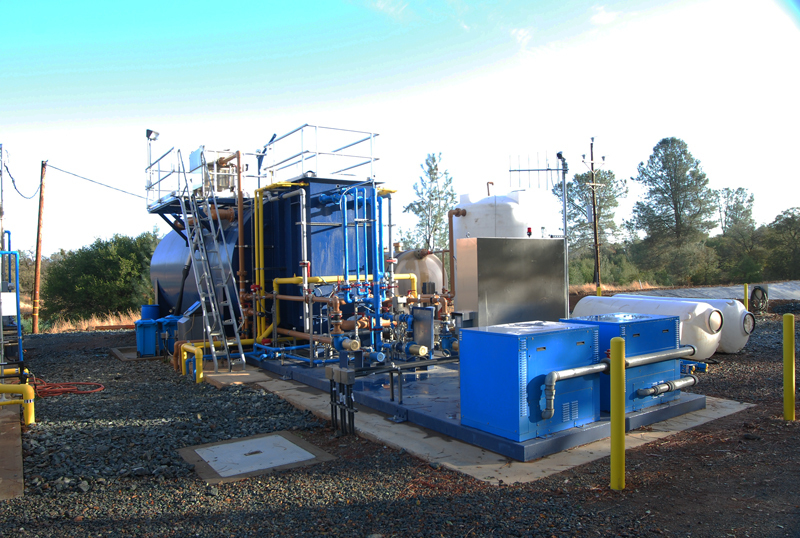 The community of Gold Village (located north of Sacramento near Marysville, CA) had a failed wastewater system that had been replaced by a temporary, mobile Fixed Film Bio-Reactor to keep the community of approximately 80 homes with wastewater treatment services. The temporary system was an expensive option, so the River Highlands Services District (operated by Yuba County) contracted with Kennedy/Jenks Consultants to design and permit a Siemens MBR as a permanent solution.IWS contracted with the Yuba County Department of Public Works to install and construct the new MBR treatment system. The River Highlands WWTP Replacement Project was funded through Yuba County Department of Public Works, the State of California, and the U.S. Department of Agriculture. The system was designed to treat and disinfect the wastewater to meet Title 22 standards, with final dispersal to a holding pond adjacent to the wastewater treatment plant.IWS’s scope of work included: a) demolition and removal of the former facility; b) construction of a new building to house the UV and Chemical treatment equipment; c) installation of a Siemens Express MBR Unit to treat up to 25,000 gpd; d) installation of a new electrical service (including radio communication between the influent lift station and the Siemens unit); e) construction of a fully lined emergency storage pond with a 60 mil HDPE heat welded liner complete with an anchor trench and conveyance lines; and f) installed turbine pumps and controls for distribution of the treated water from the holding pond. IWS provided start-up and system commissioning with the treatment system operator, the City of Marysville. Neil Retelsdorf, Civil Engineer for Yuba County was pleased with the work, ”IWS did a great job, the project went well, and we appreciate the team work and skill IWS brought to the project.” The system is currently operating and serving the Community of Gold Village.